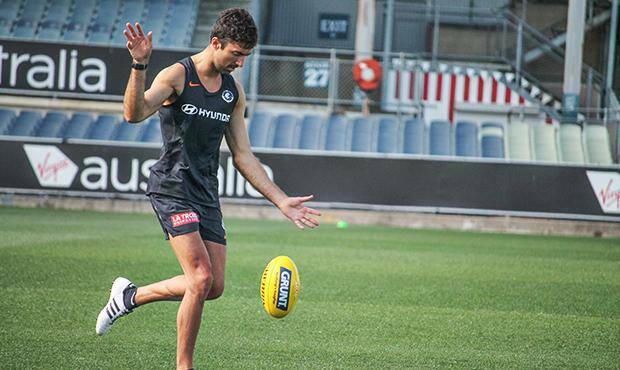 CARLTON veteran Kade Simpson has hit the track early ahead of his 17th season in the AFL. The Blues returned to pre-season training this week, with newly minted co-captain Sam Docherty also joining the club's first-to-fourth-year players at Ikon Park. Docherty and Simpson featured at training on Monday and Wednesday respectively, with the remainder of Carlton's playing group not expected to return until November 19. Simpson, 34, has penned a one-year contract extension to continue his career into 2019, ahead of a year where he is set to break yet more games records with the Blues. Having become just the fifth Carlton player to reach 300 games last season, Simpson needs to feature in just six more matches to surpass Stephen Silvagni in the all-time list of career games for the club, while he needs 22 more appearances to pass John Nicholls in third. Docherty also returned for pre-season training early, almost a year after rupturing his ACL in an injury that sidelined the 2017 All Australian for all of last season. Promising defender Tom Williamson returned to training on Monday after missing the 2018 season with a back injury, while young midfielder Zac Fisher was also on the track as he continues his recovery from a broken leg. Back and raring to go. "The leg's feeling really good," Fisher told the Carlton website on Monday. "I did the rehab … I'm expected (to be back in full training) in about three or four weeks, but they'll start introducing my loads and I'll start running and kicking more as the weeks go on." Gun forward Charlie Curnow was also back in action after suffering a knee injury in round 23 last season, with the 21-year-old avoiding surgery despite medial ligament damage. New recruits Mitch McGovern and Will Setterfield were also in action this week, having joined from the Crows and the Giants respectively during the NAB AFL Trade Period.